You are certainly wondering what we have been doing these past few weeks. In this update, we will gladly bring you up-to-date and deal with the two most important topics: our new pet sitter insurance and the announced design relaunch. Over the last few weeks, we have already made numerous optimizations and added new features to the website. Some of these changes were made in the back end, e.g., the expansion of the search function (post code search) or adjustments to the database structure. In addition, we have introduced other small changes, for instance the "qualified pet sitter" badge, which we give to all pet sitters we have checked, and optimizations in the checkout process intended to increase conversion. A large update is going to be released soon: our new homepage. 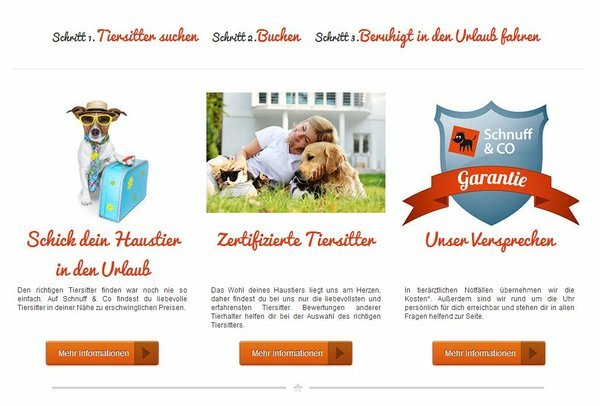 By means of even more specific information for pet owners and sitters and emotional pictures, we want to meet the needs of our visitors and motivate them to deal more intensively with our service. For this purpose, we are going to integrate our animated how-to video and authentic customer opinions in the future. We still have to make some minor changes, so the homepage should be online within the next 2 weeks. Since safety and trust play a central role in our business, we are going to cover the cost of emergency veterinary treatment from now on. Should an emergency, an accident, or a similar sudden and unexpected event cause veterinary treatment and/or medication to be necessary while the pet of a Schnuff & Co customer is under the care of a pet sitter, we will cover the cost for this treatment up to a maximum amount of € 500 for each pet. This free pet insurance is another milestone on our way toward our goal of offering our customers an all-inclusive package.